The HS family of remote controls is based on the Linx HS Series encoder and decoder. It is ideal for general purpose remote control and command applications which require high security. The remote controls can be configured with 1 to 8 buttons and the keypad and labeling can be customized. The HS Series uses CipherLinx, a remote control encryption technology that provides ultimate RF security and unprecedented features. CipherLinx technology never sends or accepts the same packet twice and changes codes with every packet sent. The HS Series also provides a wide range of innovative features including the ability to establish user groups and button level permissions. The HS Long-Range Handheld transmitter is ideal for general-purpose remote control and command applications that require the highest level of security and longer transmission distances. The small transmitter has a line of sight range of up to up to 1,000 feet (300m) when combined with an LR Series receiver and HS Series decoder. 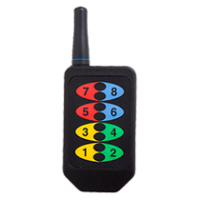 As a part of our HS family of wireless remote controls, it is available in 315, 418 (standard), and 433.92MHz. It has been pre-certified for FCC Part 15, Industry Canada, and European CE (433MHz only) compliance, reducing costs and time to market. The HS Compact Handheld transmitter is ideal for general-purpose remote control and command applications that require the highest level of security. The small transmitter has a line of sight range of up to up to 750 feet (230m) when combined with an LR Series receiver and HS Series decoder. 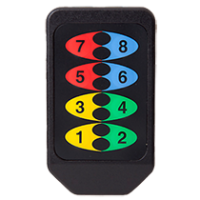 As a part of our HS family of wireless remote controls, it is available in 315, 418 (standard), and 433.92MHz. It has been pre-certified for FCC Part 15, Industry Canada, and European CE (433MHz only) compliance, reducing costs and time to market.